Multifunction printers (also called all-in-one printers) combine a printer, scanner, copier, and sometimes a fax machine into a single device. Having all these functions in one unit not only saves room, but it can also be more affordable than buying separate individual devices. But with that convenience comes questions about how to differentiate between seemingly similar all-in-ones. If an MFP is on your shopping list this holiday season, here are some tips to keep in mind when considering different models. Inkjet or laser: MFPs use either inkjet or laser technology for printing. Inkjet is ideal for consumers and small businesses with modest print demands. Laser MFPs are good for medium to large businesses that print often. Inkjet and laser MFPs targeted at businesses print using four colors, which are enough for charts, graphs, and text. Inkjet MFPs that use more than four colors do a better job at printing photos; more colors allow the MFP to create a wider range of tones. An MFP’s initial price may seem attractive, but remember to factor in the cost of replacement ink or toner over the long haul. Ink can cost between $10 and $40 per cartridge, while toner for laser MFPs can cost $50 to $100 or more per cartridge. How fast can you go: Print speeds are usually rated by how many pages per minute (ppm) a printer can produce. Image quality settings can affect print speeds, and not all manufacturers use the same quality settings. Many manufacturers derive speed ratings from draft mode to get the fastest numbers—keep in mind, the print quality isn’t optimal at that setting. Page counts: Most base model MFPs hold between 100 and 250 sheets of paper. If you plan to print frequently, consider an MFP with a large paper capacity, or optional additional paper feeders. A built-in duplexer allows you to print on both sides of a page. That can save paper over the long haul. However, using the duplexing feature can increase the time needed to print. 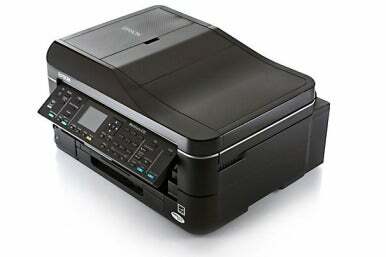 What about the scanner: Most MFPs come with a good, general-purpose color scanner that performs 24-bit scanning. These scanners can handle business documents, charts, and artwork. They’re also suitable for non-professional photos. Professionals who want the highest quality photo scans should consider a separate scanner that can perform 48-bit scans. The scanner on an MFP does double duty as a copier. Look for an automatic document feeder if you want to be able to copy multi-page documents. Make a connection: A majority of MFPs have USB interfaces for connecting to a single Mac. If you have an AirPort Extreme, AirPort Express, or Time Capsule at home or in a small business, you may be able use USB to connect the MFP to the network device and share the printer over a network. To connect a printer in a medium of large business, look for ethernet or wireless connectivity. This may not come as standard equipment, and may require an additional outlay. Some MFPs also support Bluetooth for printing from portable devices. The Epson Artisan 837 color inkjet multifunction is a high-end home printer that aims to give you pretty much every feature you could possibly want, plus stunning photo quality. Although its $300 purchase price is high, its ongoing ink costs are quite reasonable. Read our full review. 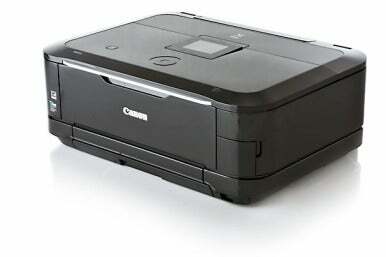 The Canon Pixma MG6120 color inkjet multifunction printer offers a lot for the money, including impressive performance and features, and a shiny-black, touch-panel design. The Canon Pixma MG6120 ($200) manages to look stylish and perform well, a killer pairing in any area of life. Read our full review. From the small-office perspective, have a look at Oki Printing Solutions MC561 color laser multifunction printer. This unit is well equipped for a busy workgroup, with full print/copy/scan/fax features, outstanding speed, and superior text quality. The Oki MC561 ($750) has even more to recommend it—including price and paper handling. Graphics quality is acceptable for mainstream business use. Read our full review. If posters, calendars, or fancy brochures are in your small office’s future, check out the Brother MFC-J6710DW color inkjet multifunction printer, which can print, copy, scan, and fax at media sizes up to 11 by 17 inches (called ledger or tabloid, depending on the orientation). At $300, it’s fast and has some excellent features, as well as reasonably priced inks. Read our full review. 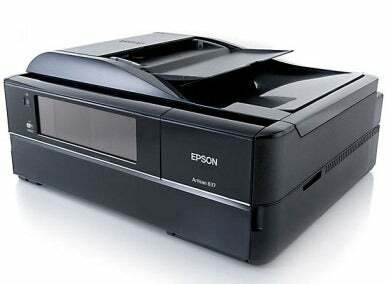 Epson’s WorkForce 635 earns its $200 pricetag with impressive speed, print quality, and features. Even better, its inks are reasonably priced. The Epson WorkForce 635 has a lot to offer for a small or home-based office. Read our full review.